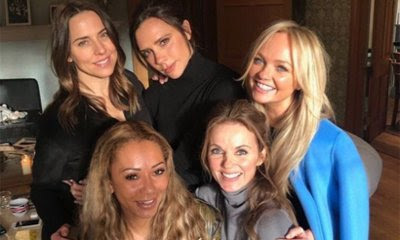 The five-piece band, Victoria Beckham, Mel B, Mel C, Emma Bunton and Geri Horner, met up last week for the first time in almost six years to discuss future opportunities. While they are believed to have discussed the idea of TV shows and other endorsements, another prospect mentioned was a music company through which the band members can forge up and coming "girl power" talent. "The girls all brought their ideas to the table and that included Mel C raising the prospect of a Spice Girls record label," a source told Britain's The Sun newspaper. "It went down very well because they are all excited about backing up-and-coming talent, possibly even new girl bands. "This reunion is all about securing the Spice Girls legacy, and their own company could be one way to do that." Following the meeting, Emma opened up about the girls' meeting to her Heart FM radio co-host Jamie Theakston on Monday, revealing that they will need more meetings to figure out their next steps, as they had to halt their meeting after hours of chatting to collect their children. "The main thing was that we sat together and have gone, 'Right, there’s things, there’s opportunities here, are we all in?' So exciting things to come," she said. "After the meeting there is growing confidence about a full-scale tour, at the end of this year or early next year," the source continued. "Mel C still needs to be convinced but Victoria is on board for the moment. They’ve been in constant contact on WhatsApp and on the phone since the first meeting and are all genuinely excited."